When I share my work online, I frequently get comments along the lines of “beautiful painting!” In fact, it’s become so frequent I’ve gotten to the point where I simply say thanks. That facile acknowledgement is because my process of creating art lies in some netherworld between photography and painting and trying to explain that to the casual observer is no easy task. In fact, I’ve thought of writing something on the subject for quite some time and I’ve never known where to start. I know some people would suggest making a video, but Bob Ross, I’m not. I don’t believe I could make such a video remotely interesting, Not to mention I’m sure it would totally break my rhythm to try to explain my process of creating art while I was in the midst of it. Maybe some day, but I’m not there yet anyway. For now we’ll have to make do with words and hopefully an illustration or two on the subject. Once upon a time, my process of creating art was simple to explain. It was the by comparison simple composition of a shot in the viewfinder and the various decisions one could make in regards to shutter speed and depth of field. Even now, I would hazard a guess that at least 90% of my artwork begins with a camera. But these days even images that look fairly photographic in nature have likely been taken further afield from their origins than one might suspect. It’s often little things like maybe a person wasn’t quite on the mark where I wanted them in the composition. Perhaps the clouds were too dull or the sky too clear that day. There’s an anecdote about creating art in the form of statues that’s often attributed (incorrectly) to Michelangelo. In that old story, it’s said that the process of sculpting is revealing the statue hidden within the block of stone. The story may be apocryphal, but I comprehend some of it in my work, that I’m revealing the image I would have had if only all of nature had been in my control. In some cases, my work is more removed from reality than others. And those in particular are the images that are most often identified as paintings. It was actually in my latest process of creating art that I decided I wanted to tackle discussing this, so it only seems fair to share a snippet of that latest piece here. This is a selection from my latest London themed art print. The thought of sharing this one in particular was partially selfish. This is one of the largest pieces I’ve done so far. The file size is actually sufficient to print a 4′ by 7′ print! I can only guess if anyone will ever want a print that large, but creating art at that scale, the details are rich as you can see! And most people seeing it online will never get to see the small details! This particular artwork is something of a collage with antique maps of London forming part of the backdrop, but believe it or not, there are still photos involved in this work. 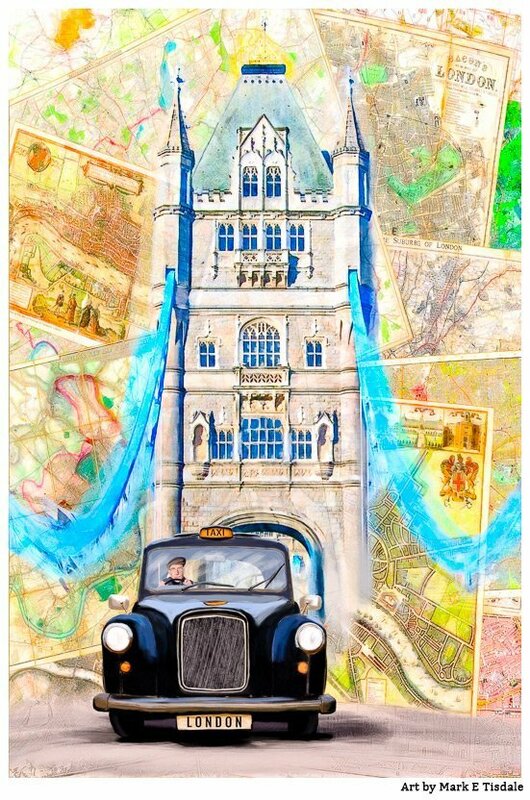 But it’s very much a hybrid of photos from shots of Tower Bridge and London black cabs on past trips to the city and even an antique family photo. 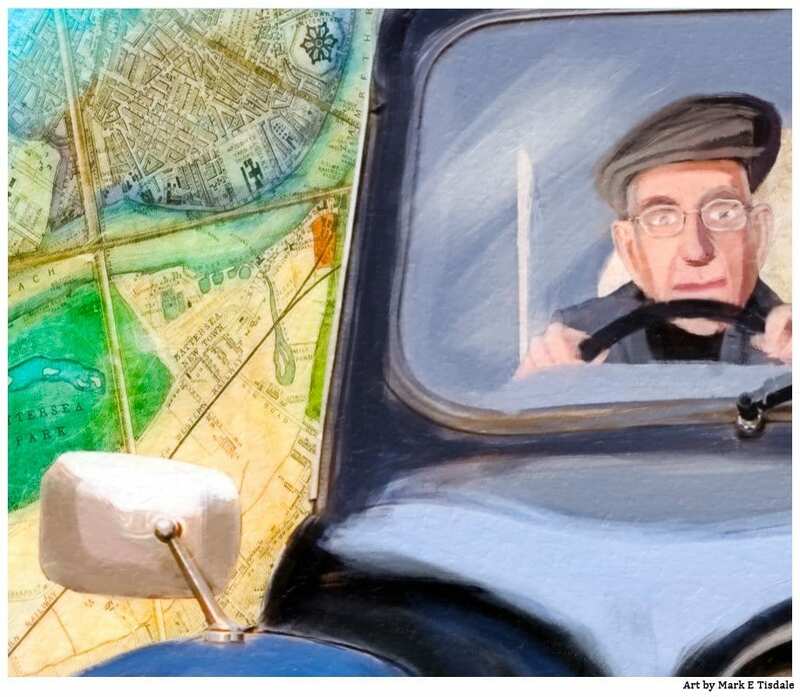 You see, the old ‘cabbie’ behind the wheel is probably a distant relative. His likeness was based on an old photo of my grandfather’s. The people in the photo have so far been unknown to anyone still living but this guy has a family likeness that has led me to believe a family member of some description. Mind you, none of this artwork is a direct translation of the source material but it’s in there. There’s no canvas or paper or physical paintbrushes involved in my work. There’s me, my computer, and my Wacom Intuos tablet. I’ve toyed with the idea of branching out in the direction of physical painting some day, but it may be like my dabbling in film photography in the past, little more than a fleeting fancy. I have to admit being spoiled by digital art. There’s no push button painting here. It’s all done by hand, but because it’s on a computer, I can work on all these elements in separate layers and start over if I have a mind to without destroying other elements in the work. In this example of creating art, the bridge, the taxi, the maps, were all conceived and created to be together in this final artwork. However because I created each element independently, creating the cab for example didn’t mean destroying the underlying layers. For anyone who learned to type on an actual typewriter, this is the difference between a typewriter and word processing in the world of art. On a typewriter, if you made a mistake or simply wanted to change a paragraph on page 10 once you were on page 15… you had a lot of pages to retype. Computers changed all that and have done for art as well. I would never begin to say this made digital art inherently better but it does make it a good fit for me. I love the freedom to back up and change the way I’m telling my story without entirely starting over! It also means I have the freedom to experiment. When I was in college, I signed up for an introductory drawing class. I attended exactly one class and the extensive list of materials needed sent me packing. Now I later learned that was a strategy favored by some professors to weed out the people who weren’t truly committed to being in the class, and those beginning classes were always full with students on the waiting lists. Fortune favored those who registered early! It’s interesting to contemplate how things might have been different had I stayed in that class then. Yet at the end of the day, the speculation gets nowhere, but I do know the fact I can sit down with my tablet and computer and do whatever I want without wasting paper, canvas, or paints and pencils has helped me come a long way in the last few years. I was probably never going to be a photojournalist, but a journey in creating art that began with a camera has evolved to include many other tools. And I’ve little doubt that evolution will continue in years to come. I may not have shown my process stroke by stroke, but I do hope this post on my process of creating art offers some insight into my work? When I began writing this it was to have something to share with those people who ask “is this a painting or a photo” as well as those who say “beautiful painting!” I never quite know how to answer the first statement – should it be C ) All of the above? And the latter, well, I hate to make people feel like they’re being corrected when they are admiring my work. And in the end, the images matter more in my mind than the medium or the process behind it. There’s the same need to tell stories that underlies it whether it’s done on a cave wall or a computer monitor.